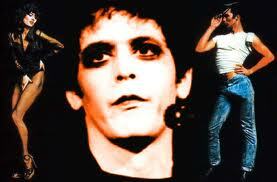 I thought I’d resurface today to mark the passing of one rock ‘n’ roll’s great icons – Lou Reed. In musical terms I’ve followed much of his output with varying degrees of interest – of special mention must go The Velvet’s Andy Warhol album and the amazing double live, lo-fi 1969 record – recorded at some point in the late 60’s I believe. During the seventies he had interesting collaborations with Bowie and hit a – for me – creative peak with his sublime New York album. Seriously, if you haven’t heard New York, you owe it to yourself to do so. Pure guitar, bass and drum, recorded effectively live and totally stripped down – with some of powerfully venomous lyrics – even taking a swipe at His Bobness in one song where he asks – “Does anyone need another self-righteous rock singer whose nose, he says, has taken him straight to God”. But, as is so often the case these days in this age of recycled pop, he is probably best remembered for a cover of his song Perfect Day by the BBC for Children In Need – so ironic that a song written with one particular subject in mind could achieve such fame when its meaning is turned 180 degrees. So Lou has been unwell for a year or so. His wife, Laurie Anderson (she of “O Superman” fame), declared only a few months ago that he was saved from certain death by a rushed liver transplant. I was secretly pleased Lou had joined our exclusive club. However it seems that his underlying health issue was beyond repair though and so it leaves me to recognise the passing of another great. R.I.P. Lou Reed. This entry was posted on October 27, 2013 at 7:48 pm and is filed under Liver Transplant. You can subscribe via RSS 2.0 feed to this post's comments. Yes indeedy – at this rate we’ll probably not even play New Malden! I just found your blog and I have to say your story is inspiring. I am 26 and need a heart/liver transplant. It is comforting to hear how other people cope and show such courage. Thanks for sharing your story.